﻿World Wildlife Day: Calendar, History, Tweets, Facts, Quotes & Activities. World Wildlife Day seeks to celebrate the world's plants and animals while raising awareness of issues that impact wildlife. Wildlife refers to all undomesticated native plants and animals of a region. The day also serves to highlight issues such as urbanization, poaching, pollution and destruction of wildlife habitat and the ways that humans can contribute to conservation efforts. 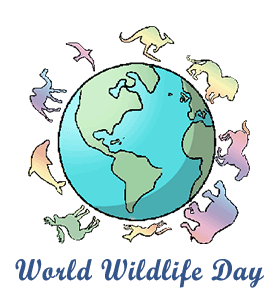 The United Nations General Assembly proclaimed World Wildlife Day in December of 2013 as a celebration that would take place annually on March 3rd. The date chosen coincides with the day the Convention on International Trade in Endangered Species of Wild Fauna and Flora (CITES) was signed. The CITES is a document that regulates trade of wild animals and plants around the world. Elephants, pangolins, rhinoceros, sharks and tigers are among the most critically poached and trafficked species in the world. According to the UN, the biggest threat to wildlife is habitat loss, as well as overgrazing, farming and development. Habitat loss accounts for 80% of the loss in biological diversity. At the current rates of extinction, nearly 20% of the world's species could be extinct within the next 30 years. Enjoy the planet’s biodiversity by visiting animals in a zoo or on a safari, visiting a nature museum, a botanical garden or a national park to see the wide variety of flora and fauna with your own eyes. Volunteer to help clean up trash and other debris along a beach, park or stretch of road. This garbage and debris pollutes the water and land habitats of our planet's plants and animals. In addition to polluting, this garbage and debris can be ingested by animals or can act as a net and trap them. Watch documentaries about conservation efforts and global loss of biodiversity. Some of our favorites include, Call of Life , End of the Line , Home (2009) and Garbage Island . Make a donation to one of the many organizations that conserve and protect the planet's biodiversity. Organizations include the World Wildlife Fund, Wildlife Conservation Society, Wildlife Alliance and Animal Welfare Institute. Host a wildlife party. Prepare different trivia questions and facts about animals and plants and divide your friends into teams to see who is the most knowledgeable about the world's biodiversity.